Handwriting is a skill that improves over time and with practise. Tracing shapes, sounding out letters and writing the alphabet will help children improve their handwriting, reading and language skills. Handwriting is a complex skill that adults can take for granted. Most children are not ready for the complexity of the task until about age six, when they moving from a palmer grasp to an incomplete tripod grasp. Some children will be able to write before starting formal education but, nationally, there is no expectation that children need to know how to write as a requirement to enrol at school. Bubble wrap – children love to play with bubble wrap. The action of popping the bubbles between the thumb and index finger helps to strengthen fingers for a more controlled tripod grasp. Clothes pegs – helping to hang washing on the line and hang up clothes improves finger movements and strength. Water pistols – children love water pistols and squirt guns. The pulling of the trigger is an action which develops a strong index finger which again supports the tripod grip. 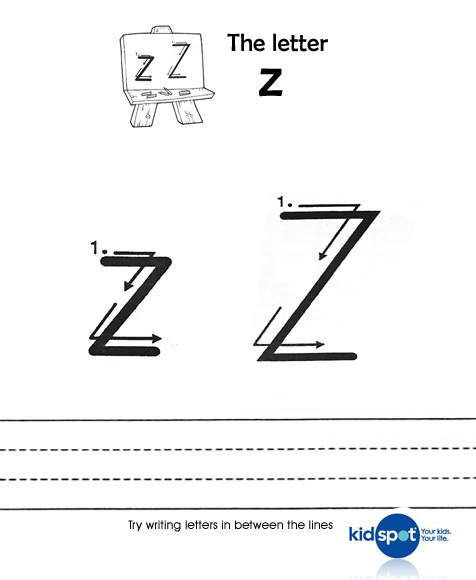 For some more practical lessons, print off the letter Z and have your child copy the letter within the lines provided. This will not only get them familiar with the shape of the letter, they will become more comfortable in holding their pencil. Click here to print the letter Z.